Welcome to this guide to making water kefir. We’ve done all we can to make the process of making your first batch of tasty water kefir as painless, and successful as possible.Understanding the process will ensure a great product that you and your family can enjoy. Making water kefir at home is actually a simple process, but in the early stages, whilst you get into the swing of things, it’s good to have a step by step guide you can follow. I've included all the instructions in this article, with a couple of detailed videos on the process. I'll be detailing the health benefits of water kefir and kombucha in a future article, but if you are desperate to learn more about the health enhancing benefits of fermenting, check out my mini course on how to make kefir milk. The benefits or water kefir are similar. There are very few equipment requirements for making kefir water. Basically you are going to need a container for culturing your water kefir (ideally with a close fitting lid for storing the completed product, and a simple cover to use during the fermentation process. The videos provides a clear process, with me starting with my brand new water kefir grains, purchased on Amazon. If you follow these instructions you'll have a successful batch or sparkling water kefir in a matter days. When you first start, you'll only have a tablespoon of grains. This won't be enough to make a liter or more of kefir water. You'll need to start with a smaller batch, and then gradually increase the water/sugar solution volume as your grains grow and replicate. 1. Water Kefir Grains - ideally, if possible, get grains that have been cultured in filtered water and organic sugar and fruit. Aiming for as high a quality of ingredients as possible should be at the forefront of our food production ethos. This is not critical, any kefir grains will, over a short period of time adapt to their new environment. Note: Water and milk kefir grains are different, and cannot be alternated. 2. Filtered Water or boiled cooled water 500ml / 2 cups to start. 3. Organic sugar - 75 grams to start. 6. Glass jars for fermentation and jars/bottles for storage. 7. Cloth or muslin to cover, with elastic band to secure. 8. Non-metal stirring implement, I like a chopstick. 9. Large bowl or measuring jug for straining. 10. Nylon mesh sieve for straining. 11. Nylon or plastic spatula to push thick kefir through the sieve 12. Slotted spoon to remove floating raisins. You may have some of these bits of kit at home, in fact, I'm certain you will. I needed to buy a few things, just to get myself up and running effectively. I always find Amazon to be one of the easiest and most cost effective places to source fermentation kit. Note: You can also make kefir in a ceramic fermentation crock if you like. Certainly not essential. Here are some links to some high quality products on Amazon. Check them out if you need anything. 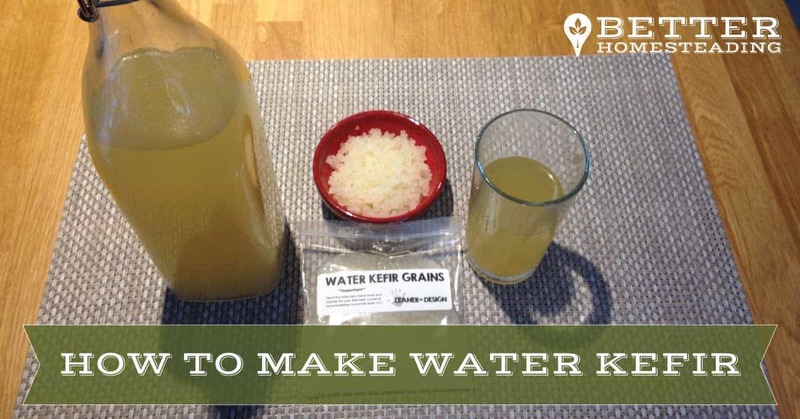 When you buy water kefir grains, be sure to get them washed and into some more sugar water solution if you aren't going to be making kefir that day. As you’ll see in the video, when one purchases live water kefir grains, you’ll generally receive around a tablespoons of grains. These will multiply as you continue to use them to make kefir, but to start with, use 2 cups/500ml of milk for the first 3-4 ferments. This will also provide you with a good sized glass a day of sparkling water kefir to drink...excellent! Once you start to see a quickening of the fermentation process after 3-4 days, you can increase the water to a litre or so. I tend to stick with a litre, which lasts me for a couple of days, and have a batch of kefir on the go almost all the time. Expect to see signs of fermentation such as the bubbles rising in the fermenting jar, the fruit starting to oat etc. Be mindful that as the grains increase in volume, they can become too hungry for 500ml of water, so you will need to increase the volume of water, sugar and raisins OR simply remove some of the grain mass, start another ferment in a second jar. Your one-time starter kit of kefir grains will be all you ever need to produce kefir, as long as you make sure they are ‘fed’ with sugar every 24-48 hours. I recommend using sugar and fruit, or you could use fruit sugar, palm sugar. Do not use honey as it has anti-microbial properties. Artificial sweeteners like Stevia are also not suitable, the bacteria need real sugars to survive. 1. Cleanliness is important at this stage. No need to go down the whole sterilization route, just hot soapy water is fine. Rinse with fresh water and allow to dry before using. You don't need to wash the jar every single time you refresh it, I like to just give it a good clean out once a week or so. 2. Rinse your newly bought grains in filtered water and break up any clumps. You're trying to maximize the surface area of the grains. The greater the surface area, the more contact the yeasts and bacteria have with the sugar water, the quicker the final product will be ready. 3. Add 2 cups/500ml of cool filtered water to your fermenting jar. 4. Mix the sugar, raisins, half lemon, root ginger (if using) together until the sugar is dissolved. 5. Stir the water kefir grains with a non-metal implement, a chopstick or nylon spatula works well. I like to use a piece of muslin cloth or a coffee filter to cover the jar, sealed down with a rubber band. Anything that will prevent flies or dirt from getting onto the liquid is fine. Do not seal with a lid UNLESS you are only filling the jar 2/3 - 3/4 full. The fermentation process causes a build up of gas in the jar, which needs to escape, and can result in a sealed jar exploding from a gas build up. However, if you don't overfill the jar, and crack the lid a couple of times a day to release some of the gas, you an keep the jar sealed. This leads to a fizzier water kefir product, which I personally like. Just remember to 'burp' the jar a few times a day. 6. Place the jar in a warm, dark place. High on a pantry shelf works well or me, or in a high cupboard. The darkness is required to prevent the damaging of light sensitive vitamins. A towel works fine if you don't have a cupboard. Maintaining a stable temperature is a good idea. The higher the ambient temperature the quicker the fermentation process takes. Winter time will result in very slow fermentation unless you keep your jar in a warm place. The duration of your ferment will determine the sweetness of your kefir water. Taste each day to find the taste you prefer. If you leave it too long the result will be very dry, and your grains may die if you fail to feed them with sugar. 7. Leave for 18-48 hours, depending on temperature and desired result. Stir from time to time, the grains like to be agitated. 8. Once the fermentation is complete, use a slotted spoon to remove the floating raisins from the surface of the fermenting vessel (a large mouthed jar makes this easier) Pour the finished kefir from the jar into the nylon sieve, placed over a large measure jug or bowl. A jug makes it easier to pour into storage containers. Remove any rogue raisins from the grains. 9. Place fresh sugar, raisins, lemons and ginger into the jar and add 2 cups / 500ml of filtered water. Stir well, add the kefir grains and place back in the warm place. Repeat process each day. 10. Place the completed water kefir into a sealed jar (jars) or bottles (I like the Kilner type with the spring top lids although these are not a requirement), leaving 2-3 inches of space at the top of the jar. Place back in a warm place for a couple of hours to allow the 2nd fermentation to really carbonate your kefir. Then place in the fridge to cool. Drink at one’s leisure. 11. Repeat this process for the first 4 days after purchasing your new grains, then gradually increase the quantity of water you use, up to a litre or two is perfect per ferment, adding additional sugar and raisins as required. The standard sugar/raisin quantity is good for 1 litre of kefir. This second video gives a detailed guide to how to progress your kefir water after the initial ferment. As I mentioned, it takes time for the grains to multiply to a point that they can ferment enough water and sugar to keep you supplied with kefir for yourself and family. It only takes a matter of a week or so though, and you'll be giving the grains away for free!!! Hygiene and cleanliness are important when handling and working with foods. Although kefir production is healthy and enjoyable, and we ensure we produce our kefir grains to the highest standards of cleanliness, there is no guarantee that your kefir will remain free of pathogens forever, if you do not maintain adequate cleanliness. Ensure you keep all jars and implements clean and sterilised, and inspect your kefir for mold. Do not drink kefir that appears moldy. Drink any batch within 7 days of making. Kefir is a great addition for health, but should not replace medication, or be used to treat any medical condition without consultation with your healthcare practitioner.